Welcome to Cooking with Grace! This is where Grace Singleton, a managing partner at the Deli, shares her favorite products and delectable home cooking tips with us. 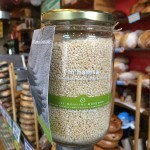 This week, she tells us about the new harvest olive oils that just hit the shelves at Zingerman’s Deli. I always get excited when we receive the new harvest olive oils, and I get my first taste of how the past season has impacted the flavor of the olives and the oil pressed from them. Olive oil harvests in the Northern Hemisphere generally happen in late fall, and as with all agricultural harvests, there’s a lot of work to be done in a short amount of time. The fruit must be picked when it’s at the perfect ripeness and flavor, the weather must be watched closely to make sure there isn’t too much (or too little) rain or cold, and pests (like the dreaded olive fly which has been a continuing problem in Europe) have to be monitored for. You also have to make sure you have all the people and equipment needed to process the harvest. There’s different levels of mechanization used in olive picking and oil pressing—but for the most part, there are always long days of work for as many of your friends, family and workers as you can bring together to help. But there’s joy in it, too. There’s a celebration surrounding the harvest—a celebration of all the people who come together to make it happen (with many shared family meals to help offset the long hours of work). Of course, there’s also the excitement of tasting the first fruits of all the labor as every year yields a different result in flavor. 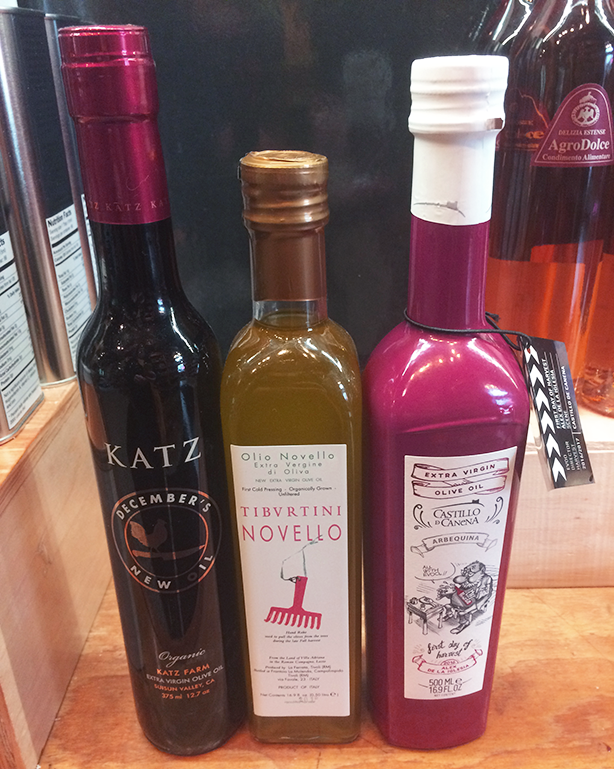 Right now, we have a limited supply of three new harvest olive oils, which can be called olio nuovo or novello depending on the producer and country of origin, on the shelves right now. Come in for a first taste of what’s to come later this spring once the remainder of the harvest is blended, rested, sometimes filtered, and then bottled for us. These are the freshest oils you will get a chance to taste, and they are all exceptional and quite different from each other. Castillo de Canena: “First day of harvest” Spain-Arbequina olives. These folks not only make amazing quality oil, they also have beautiful and unique packaging that really stands out on our shelves and makes a lovely gift. This oil has a super-silky mouthfeel with a quick burst of bitter picante flavors that hit your mouth first and then settle into arugula heat mixed with a spice similar to a Hungarian hot paprika. The aroma on this oil is big—with fresh cut grass and tomato dominating the scent. 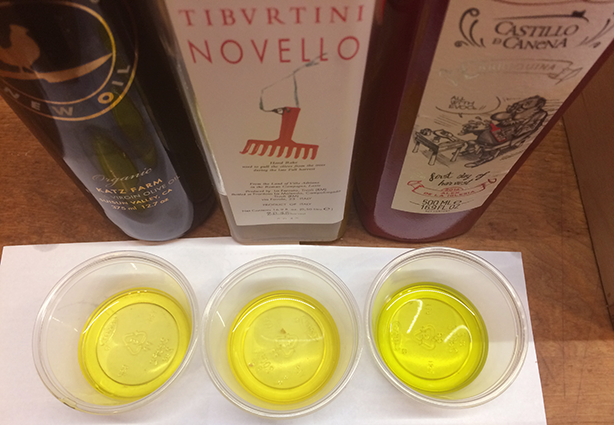 Tiburtini Novello: Hand-harvested, organically grown, and unfiltered after pressing. With notes of almond in the beginning with a smooth, thick mouth feel, this oil has a nutty buttery aroma. It has quite a lot of heat in the back of the mouth and is balanced with a clarified butter flavor and some macadamia nut on the finish. Katz December’s New Oil: Suisun Valley, California. Leccino olives from the first day of production on October 26th, and Frantoio from November 5th and 12th were blended to make this unfiltered oil. 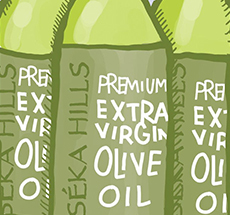 This oil has a fairly mild aroma with a fresh green spiciness. It smells and tastes alive. The mouth feel is silky, and the flavors are buttery with a developing heat that spreads through the mouth from the tip of the tongue, to the side, the back and ends in a savory taste. The heat fades to more vegetal flavors of cooked greens and artichoke. The bitter and the spicy flavors do a wonderful dance on the tongue, each in balance and taking turns leading. The heat is similar to that of a good cassia cinnamon heat: subtle yet present.